Academic All-American on the soccer team this past fall. helped the soccer team to its first conference title in 2012.
and plans to attend dental school following graduation. biological sciences with a minor in psychology. Biological Sciences has several presentations by either Biology majors or students being advised by Biological Science faculty. Recipients of Summer Undergraduate Research Fellowships (SURFs) will present end-of-summer project updates Monday and Tuesday (Aug. 12 and 13), from 9 to 11 a.m., in Fisher 139. SURF recipients and projects are listed here. A view this morning of the docks at the Great Lakes Research Center. 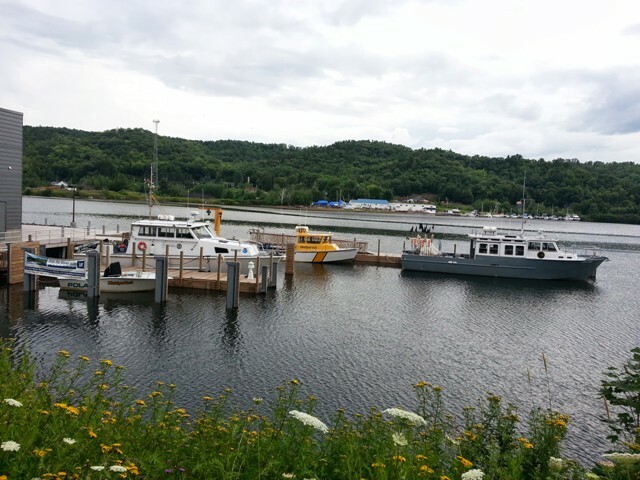 From left to right, Michigan Tech’s S/V Polar, NOAA’s R/V Storm, Michigan Tech’s R/V Agassiz and the Michigan DNR’s R/V Lake Char.